The following maps are examples of some of my work this far. This is just a few of the projects I have permission to share as many of the things I have worked with pertained to classified or private data. I have used ArcGIS products through out my career and have an up-to-date understanding of the software capabilities. I have acquired the necessary skills in order to implement and maintian GIS within a company oran organization. I am familiar HTML and have used it to create and maintain websites in a professional sense. I have been exposed to Python and have used apps and tools created with the script. I am interested in learning more. Correct imagery taken from Space by satellite. Develop and implement premier decision making processes through the use of GIS and UAV technology. Consult on proper land use practices in order to provide the most efficient and profitable yield for producers in the agriculture industry. 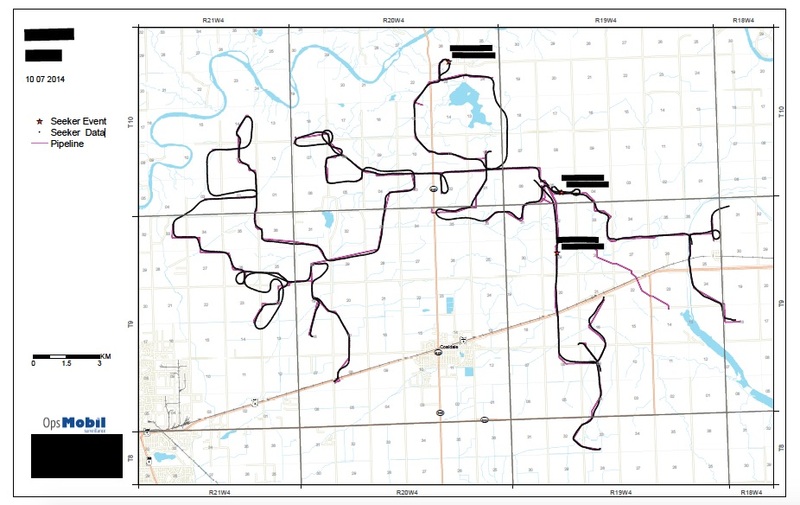 Consult on and complete projects such as creating maps and other digital representations of pipeline monitoring and exploration of prospective pipeline routes for a variety of clients. Work from a remote location while maintaining contact through telephone, email, face-to-face meetings and other communication lines with associates, supervisors and clients. Generate flight maps of routes for pilots flying pipeline monitoring flights detecting leaks. Create maps, charts, tables and other graphics representing anomalies and their locations recorded during monitoring flights. Analyze, catalogue and organize large databases to be utilized in decision-making processes. Compilation of vast or multiple sets of data and information when necessary. Use and troubleshoot tools coded in python created by GIS Analysts within the company. Consult on and complete multiple projects for a variety of public and private clients. Creation of maps and deliverables for New Mexico State Parks which included digitization of trails, roads, facilities and offices. Other products included maps representing land-ownership, management zones, confidential archeological sites, and trail maps provided to visitors. The development and application of a Human Development Index for all of Dona Ana County, New Mexico. Three variables, including health, education and income, where combined to determine the human well-being of each sub-area within the county. The results where then mapped and categorized. The resulting maps are currently used to make future management decisions. Maps were created to represent current transit routes for El Paso Metropolitan Planning Organization. Resulting maps for each metropolitan area in the Dona Ana County were then used in community outreach in searching for future possible transit stops, routes and facilities. Digitization of land-use for all of Dona Ana and Otero County, NM was also completed. Conduct analytical research into various topics applicable to relevant work and generate reports to be shared with associates or clients. Accompanied NMSU Facilities/Operations collection to gather worker input on more efficient routes, taking into account “On the ground” knowledge of traffic, pedestrian volumes, idle zones, etc.